Weeks of intense rumours reached the national media today. Sun journalist Alan Nixon – ghost writer of Stuart McCall’s autobiography no less – has Tweeted that the Bradford City manager was “close to [the] exit”. He signposted a Sun piece he had written stating crunch talks would be held this week between McCall and the club’s German owners, Edin Rahic and Stefan Rupp. A few hours later, it was McCall’s turn. “100 per cent I won’t be resigning,” he told the Telegraph & Argus. So is that the end of the matter then? Well not according to many on social media, including Nixon. The suggestion from them is McCall might not resign, but could soon be gone. Remember when close seasons were quiet, boring affairs? I miss being able to switch off from Bradford City matters. For the second summer in a row, a break from football matches has led to a soap opera taking its place. In my position as editor of a prominent City website, every day involves hearing another rumour from someone professing to know someone in the know. So just what on earth is going on? Well, rewind back to the aftermath of Wembley and not a lot should be. Less than 24 hours after Steve Morison broke Bantams hearts, rumours that Stuart would be sacked surfaced and the speculation about a parting of ways has never gone away. In the same piece he admitted the expectation was for a mid-table season. So although everyone was disappointed by how the season ended at Wembley, the performance of McCall was certainly not in question. Indeed with everything about their approach geared towards long-term thinking, it would have been a shock had they deemed a play off final defeat worthy of swapping managers. As we wrote on WOAP last week, McCall was desperate to retain the bulk of the squad that had come so close to taking Bradford City to the Championship – and this remains the crux of the recent uncertainty. Having already lost James Meredith and Billy Clarke, Rory McArdle is seemingly about to turn down the contract offer and sign for Scunthorpe United. The futures of Tony McMahon, Mark Marshall and Matt Kilgallon remain uncertain too. The perception remains – rightly or wrongly – that the owners have offered unattractive deals to players who have been a huge part of recent successes. And that is what the rumours have centred on. The owners have a clear philosophy of wanting to sign younger players with the potential to develop and increase in value, taking the club upwards with them. McCall believes that the experience and quality offered by the out of contract, older players is vital if City are to bounce back. With McCall back in Yorkshire this week, after a week’s holiday and a trip to Hampden Park on Saturday, the stage is set for talks that will hopefully resolve the situation. If there has been a fall out, all parties can put it to bed and publically drive the club forwards. Hopefully. Under Mark Lawn and Julian Rhodes, Parkinson enjoyed complete say over transfers. The Rahic-led transfer committee was never going to work for the now-Bolton manager, but is something McCall would have been aware of prior to accepting the job last summer. Nevertheless the wisdom-of-crowds mantra only works if everyone has their say. McCall is justified to want to keep the players he believes are important to him, and Rahic should be willing to back that call as realistically as he can. Yes, if Scunthorpe have offered McArdle silly money there is not much the club can do and McCall should recognise this. But Rory has been a loyal, dedicated servant of Bradford City for five years. It should be really difficult for him to turn down the chance to remain at Valley Parade – hopefully Rahic has made sure this is the case. Equally the manager should hopefully be able to count on the club providing a realistically competitive budget. If McArdle and others are to leave, they need replacing with equally as strong quality. Age matters, but it cannot define every decision. The strategy Rahic has started to implement is a very sound one, but it doesn’t have to be swept through. A gradual, sensible move in this direction would fit their long-term mantra. I think what Edin is trying to do sounds brilliant, but I don’t fancy watching a struggling team of inexperienced players slump in mid-table. Neither does Stuart (who would get the blame from many fans). When the owners and manager do meet this week, Edin’s job is to sell this transfer philosophy. To be the leader who has the vision and foresight so no one panics. To convince McCall that the way forwards is one that can lead to success. If he can’t sell it to Stuart, how does he hope to sell it to anyone else? Just like Geoffrey Richmond 20 years ago, Rahic is clearly a hands-on chairman who has a lot of involvement on the football side of things. History now shows that Richmond had some difficult relationships with the likes of Chris Kamara and Paul Jewell because of his overbearing style, but they achieved some great success over this period. Rahic apparently has UEFA coaching qualifications and scouted for Stuttgart Kickers. The club’s transfer record since he took over and headed up football is very impressive. Rahic is not an amateur. He knows a lot more about football than you or I. He does indeed need to be taken seriously. 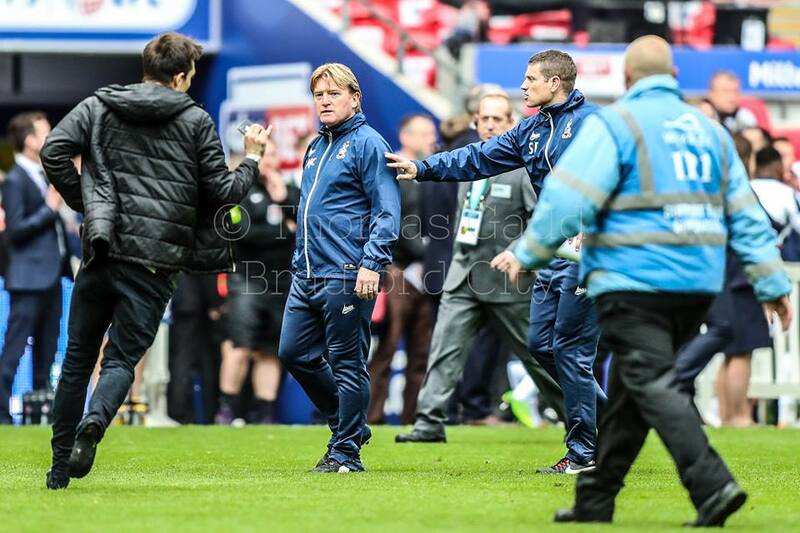 Nevertheless, Stuart McCall has been in the game for nearly 40 years, made over 750 club appearances, earned 40 caps for Scotland and managed nearly 400 matches. That is a lot of experience and he deserves the utmost respect for that. There truly never is a dull moment supporting Bradford City. But hopefully the tabloid headlines have now been and gone. When everyone meets this week having had time apart to reflect, hands can be shaken and the path forwards agreed. Edin Rahic is having a rough time from some fans right now, but the solution is there. Back your manager. In Stuart We All Trust. Rahic may partly own a football club and have UEFA credentials. (just what they are nobody seems to know?) I do know even quite expensive UEFA coaching qualifications wouldn’t be that taxing for a fan with a modicum of intelligence and an interest in the game though. I’m afraid if he thinks he knows English lower league football better than Abbott and McCall and what’s required to be successful, then this is entirely hubristic thinking and someone needs to quickly relieve him of any fantasies he has of ‘managing’ what’s happening on the pitch and the recruitment of players. I’m baffled that he hasn’t thought that the ‘buy players young, develop them, sell them at a profit’ model hasn’t been considered in the lower leagues before? Hundreds of years of possibly the most competitive lower league pro football in the whole world and Rahic thinks he’s spotted a ‘gap in the market’? Or, perhaps that model has been tried countless times across the lower leagues over the decades, but nothing can replace experience and for that quality a premium has to be paid. In the week preceding the Wembley final, Millwall’s manager, players and fans recalled the dissapointment that losing last season’s final caused and how maintaining the squad that got them there was the crucial component of their ultimate success this season. Rahic seems to know better than experienced managers and players though, after only a single season at the helm of an English club. I know the author of this article has to be careful not to ‘rock the boat’ too much. Personally speaking, I’m very worried where all this is heading. We seem to have gone from a very stable club that had a plan and made small but significant progress over the last decade. To one that’s possibly heading in the same direction as that club on the other side of Pudsey. Knowing what fans know now, who wouldn’t rather be heading into next season with McCall and the previous owners running the show? I completely agree – this summer has been very disheartening. The team we had were only a handful of points away from automatic promotion to the Championship and yet it has now been almost completely dismantled. It would be no surprise to see Stuart leave as well. City Bob: Completely agree. More and more it seems our new emperors have no clothing. All fur coat…..? I totally agree with the new chairman’s philosophy and not splashing the cash needlessly. A lot of people think we cant compete financially with other clubs i.e Scunthorpe but that’s not the case. The chairman has said we wont break our wage bill and I agree with that completely having lived through 2 administrations. It is this short term thinking of wanting everything now which got us in that position in the first place. We offered the players more than they were on which they deserve and if they want more that’s their choice. Even though its hard seeing established players leave i.e history makers Rory and Meredith we have proved we can cope without them. McArdle only started playing regularly from Jan and before that our defence was conceding less and looked stronger anyway. I would be happy if they all signed but I wouldn’t want us to pay wages outside of our budget or take up all of the budget with 3 or 4 players. The sum total of all the component parts of all this is the most worrying aspect. McCalls comments in the T&A, the rumour that has circulated within the club since Xmas, and yes this stance by the new owners of a new revolution of developing young hungrier players with potential added value. As one contributor says if this was an obvious gap in the market surely someone in the lower league would have spotted it and tried it before today. But the progress and stability steadily developed over the PP era and last season with Stuart seems to have been thrown out with the bathwater. Damaging PR if even things can be patched up now. For me it depends on exactly why these players are leaving. If it is because we simply cannot afford them then its worrying. Given the solid foundations the club had when the Germans took over and the season we’ve just had it would be very worrying indeed if players were leaving en mass because of the paucity of the contracts been offered by City. Maybe a couple would leave for the Championship but we should be able to head off any interest from league 1 clubs. If its because we’ve chosen to offer them reduced terms because their age profile does not fit into the ‘long term strategy’ then that’s a little different. I remember Wenger at Arsenal having a similar policy. Players over 30 could only be given a 1 year contract. Because of this senior players (Henry amongst them I believe) left for longer term deals elsewhere and although we can debate whether Arsenal have underachieved their Champion’s league qualification over an extended period, their financial management and the group of players they have tends to suggest the policy was a good one. I agree with a lot of your post just not the beginning. The club offered 50% more than last seasons wages according to Simon Parker which is a fantastic offer in my opinion. That also shows that its not about competing with wages but been sensible in what we offered. Rumours are that Scunthorpe have offered more than double McArdle’s wages but I think we are been correct in what we are doing. If they want to throw their cash at one player good on them but I’m happy our club does not do that regardless of how highly I think of those players. A 50% increase in anyone’s wages is fantastic but if another club is prepared to throw more money at them, then im glad we don’t retaliate and end up on a merry go round of offers. McArdle – Clearly the wages and the length of contract offered by Scunny will be a big attraction to Rory. I can see why. He’s in the twilight of his career and a big pay-day like the one offered by the Iron will certainly appeal. If the club have offered a 50% pay increase and he turned it down then I think the club has done enough to try and retain him. We don’t want to tie up a large chunk of the wage bill on one player, especially if he gets injured and misses half the season. Marshall – I understand Mark has not really settled in t’North and travelled back down south when he could (famously after the Chesterfield away game). So, I can see the attraction to him of Charlton, especially if the financial package is better than we can afford to offer. From reading comments on here and on the T&A website many posters are slating the current owners transfer policy; largely focusing on the youth element. That ignores that since the Rupp & Rahic took over we’ve recruited some good players who’re not in the full flush of youth NKP (30) Vincelot (30), Law (28) plus those players who’re still maturing – Wyke (24) Jones (23) and Dieng (24). That seems to be a good mix of youth and experience on sensible wages. Who is to say that the players recruited over the summer (and reading comments from Edin the club have targets identified) will not have the necessary experience to continue to maintain the progress made last season? “100% I’m Not Resigning”. I think Stuart has the backing of almost ever City supporter and there would be a massive backlash on the board should they decide to relieve him of his duties. Has Stuart put himself in a dangerous position? The directors should make a statement reassuring the fans that they see Stuart as their long term manager and are looking forward to building a strong and sustainable team that can challenge for promotion. We as fans tend to expect things on the transfer front to move instantly, this has never been the case with City. We will attract the right calibre of player just have patience, the board has shown that they are prepared to spend a pound or two. It has been clear for months that there have issues in the working relationship between Stuart and Edin. Any truce is likely to be temporary, due to the apparent differing views of the personalities involved, so, sad as it would be, it may be better for a parting of the ways now. The problem, of course, is what self respecting individual would be interested in taking a job, if full control of footballing matters is denied him? Regardless of the immediate outcome, a shadow has been cast over the forthcoming season. Could you clarify how “it has been clear for months that there have (been) issues in the working relationship between Stuart and Edin”? From abroad it’s more difficult for me to follow all and keep up-to-date, but I don’t recall (confirmed) stories on this? As I understand it would be “clear” I guess there have been multiple examples confirming this? Fully agree with most of the comments here. The club need to come out and make a statement one way or the other. Uncertainty will only fan the flames that keep the rumours going. A statement has been made, but judging by the reaction from fans, it isn’t going to make the speculation go away. Only added point I would make is that Crewe have always bucked the trend and concentrated on developing young players and have steadfastly adhered to a certain style of play which majored in passing the ball. Most of these players have come through Crewes academy and youth system. This is different from what City seem to moving towards. City seem intent on bringing in younger, cheaper players with potential and crucially, added value. Whilst most fans would agree with this in principle, the fear is that without experience in the team we might be taking a backward step in several years of progress. Thing is Mark we do have experience in the squad. Well Wayne we will see. In principle I agree with what the owners see as a strategy moving forward. A young talented team that is ‘ours’ really appeals to me as I personally have never been a fan of the loan system. But if that is at odds with our manager whose livelihood and reputation is largely dependent on his expertise, then I too see a problem. Stuart must also see a problem as I am sure he did not return to City to be in this situation twelve months hence. Even if McCall does not leave this summer there is an axe waiting to fall and this leads to uncertainty and tension which could have a negative impact on potential transfer targets and the squad. I would have expected a joint statement by both parties backing Stuart as the long term manager – not Stuart talking to the press alone. I have heard two rumours not sure if they are true but Stuart has put his flat up for sale (near stansfield arms) and there maybe a problem with the drink. . .